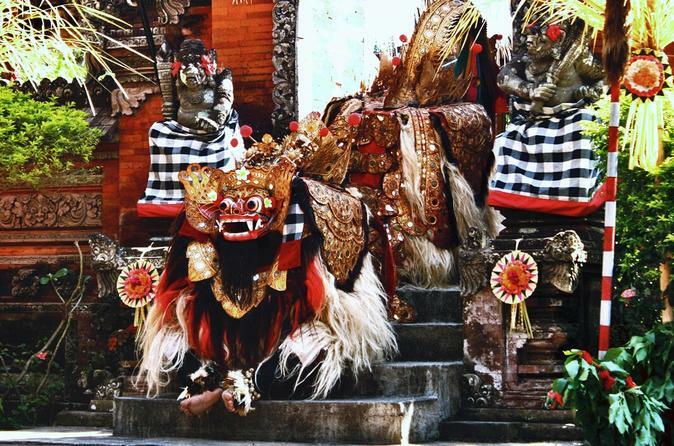 Experience a Bali cultural and natural moments,for 1 hour you will be taken to watch Barong is a lion-like creature and character in the mythology of Bali, Indonesia. He is the king of the spirits, leader of the hosts of good, and enemy of Rangda, the demon queen and mother of all spirit guarders in the mythological traditions of Bali. The battle between Barong and Rangda is featured in Barong dance to represent the eternal battle between good and evil. Continuing to rafting down the Ayung river for 2 hours. 08:00am You will be picked up at your Bali hotel by your friendly driver/guide. 09:30am You will be arrive at Barong dance performance and watch it for an hour. Barong dance will finish at 10:30am Continuing to drive to rafting departure point. 11:30am You will arrive at rafting departure point. You will get changed and get into your raft for your trip on the river. For 2 hours You will learn about different plants and living creatures along the way as you flow down the Ayung river. Your rafting adventure will finish at 01:30pm when you will have an Indonesian lunch. 02:30pm Driving back to your hotel, On the way back to your hotel you will be shown and learn the process of making "kopi luwak" which is the world's most expensive coffee. The main reason for its high cost is the uncommon method of how it is produced. It comes from coffee beans which have been digested by a particular Indonesian cat (civet) which is the reason kopi luwak is also called cat poop coffee. Here you will have a chance to tasting of all coffees or teas products for free except kopi luwak will cost you the equivalent of $5 per cup. 05:00pm You will arrive at your hotel.